It's that time of year again, the biggest show of the NXT year. August 19th, 8pm ET (7pm if you're that one person who watches NXT pre-shows), NXT take over Brooklyn for the third edition of NXT: TakeOver Brooklyn III. Coming to us from the historic (is it historic? It's probably historic) Barclay's Center with Mauro Ranallo, Percy Watson and Across the Pond Editor James' fave 'Showtime' Percy Watson calling the action. Advance press claims that for the one person who watches the aforementioned pre-show, they can expect discussion from Corey Graves, Charly Caruso, Lita and Sam Rosenberg aswell as special guests Neville, Shinsuke Nakamura, Sasha Banks and Carmella & interviews from Renee Young. Obviously the thing you're all most excited about - the theme tunes and this year, they've got a pretty bumper crop including one of this writer's current faves - Code Orange. Kicks. There will be a lot of kicks. This is not a prediction, this is a fact, these two men will kick each other a lot. There's been very little build-up or real reason for these two men to fight beyond one of them likes kicking things and so does the other and frankly it doesn't need it. 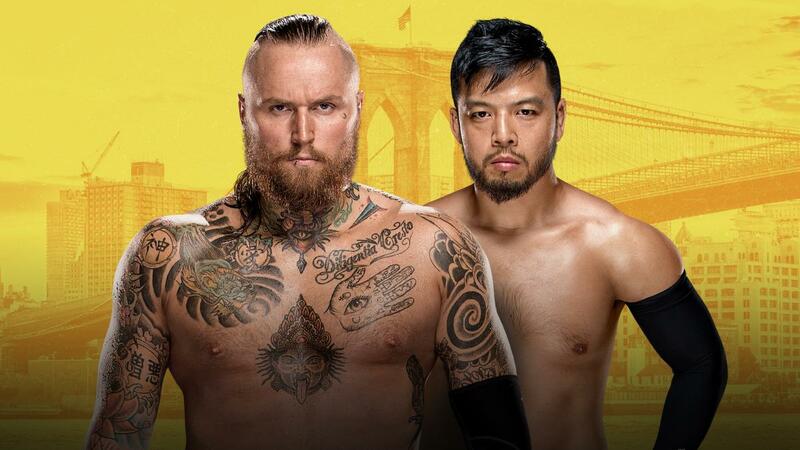 Aleister Black has been on a tear since his debut kicking Andrade Almas in the head as he's progressed from kicking random jobbers in the head to kicking anyone from ROH whose joined NXT (Kassius Ohno, Bobby Fish, Kyle O'Reilley) in the head, Hideo Itami has conversely become a bitter, salty dickhead but frankly can anyone blame him? Too much time spent out on injury can do that to a man. 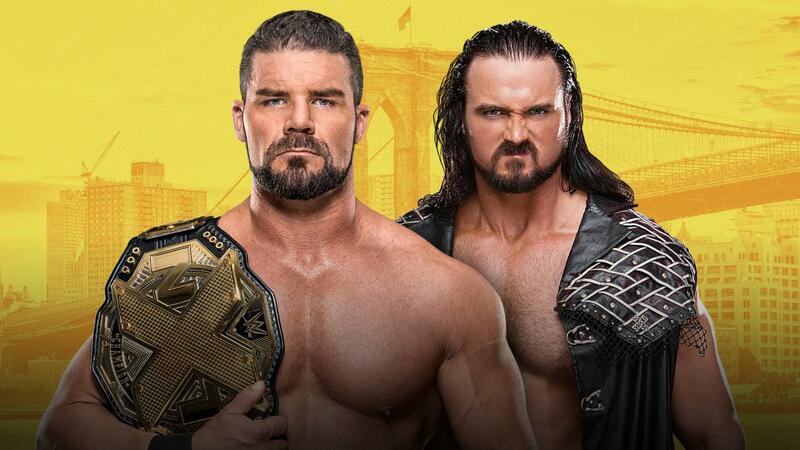 It's hard to say who's going to win this one as both men have good reasons why they could: Black has his winning streak to maintain but Itami needs to make a statement to cement him as a contender, not just someone who goes too far and just attacks people instead of actually wrestling a match. Whichever man wins, this has the potential to be the strongest announced match on this card if given long enough to get all those kicks in. There'll be a lot of kicks. Another singles match that has the potential for strong in-ring action but also has basically no reason to be happening. Andrade Almas, alongside his new manager Zelina Vega has returned with a new attitude and actual wins, yes, you heard correctly Almas has won consecutive matches, yet, he has to contend with the returning Johnny 'Wrestling' Gargano, fresh off being betrayed by his former best friend Tommaso Ciampa, has returned and is determined to remind us why he's called Johnny Wrestling. It's because he's really good at wrestling if that's not clear. I don't see them not giving Gargano the win as this is essentially a re-debut for him and as one of the purest babyfaces in WWE, a clean win for him would be a nice way to start the show but Almas could benefit more from a win against someone who matters (sorry, No Way Jose) to avoid getting that 'new top jobber' label from people like me who mistake their opinion for fact. Either way, should be fun. So this is happening, the nihilist murder babies take on the Rammstein fan club for the right to consider themselves the biggest lads in NXT. After Drew McIntyre defeated Killian Dain for the NXT Championship No.1 Contendership and Nikki Cross missed her opportunity to take Asuka's title, the crusty punks turned their attention to the tag gold with the former WxW and ICW Heavyweight champions Alexander Wolfe and Dain taking the reins as lead by Cross. But what of Eric Young, their mysterious leader, where was he? It was all part of a master plan he was concocting. This master plan it turns out was to turn up out of nowhere and attack them from behind utilising the three lads are better than two rule. Genius. How long did it take you to come up with that one, Eric? Logic would dictate that SaNItY might be in line to take the belts as frankly, what else do you do with the Authors at this point? 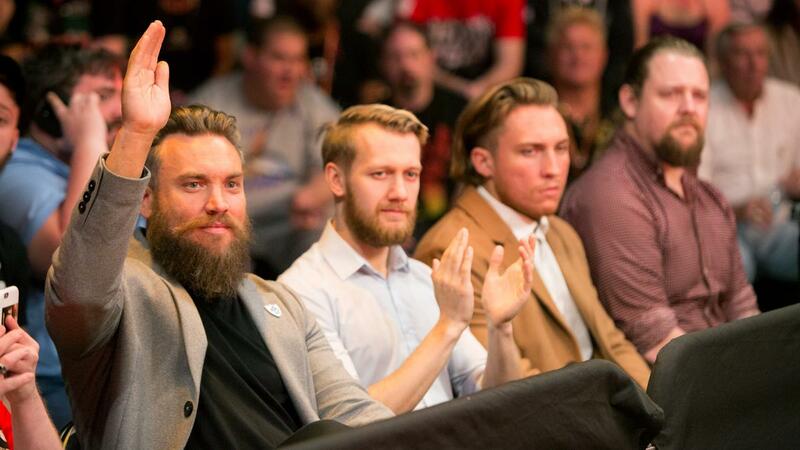 But then again, SaNItY have been suffering from that Wyatt family booking wherein they struggle to look that effective as they win matches but not feuds. 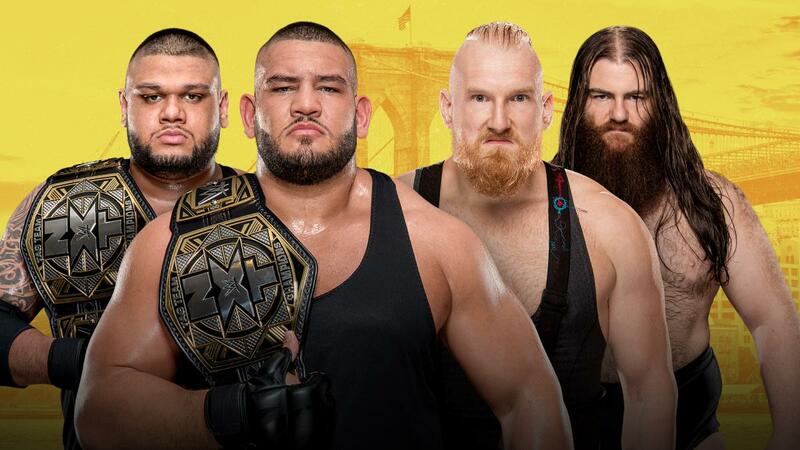 If you are the kind of person who likes watching four big lads do big lad things and also love heel shenanigans, look forward to this one as that's going to be both teams! Who do you root for? I don't know, who cares? Probably not me, moving on. First off, don't be surprised if we're shown three time ROH Champion Adam Cole (baybay) sitting in the front row somewhere before the main event as that seems to be the new favoured way of announcing big acquisitions. Secondly, it's a big show, who knows Triple H might turn up for the first time on WWE TV since WrestleMania, he was on Jimmy Fallon the other night slamming Jim through a table so he might do his standard 'This. Is. N.X.T' speech before to get everyone excited. Also, who knows? Maybe there'll be a big debut or re-appearance on the show, TM61's Shane Thorne must be close to being on the mend by now? The big question is could there be another match added to the card? 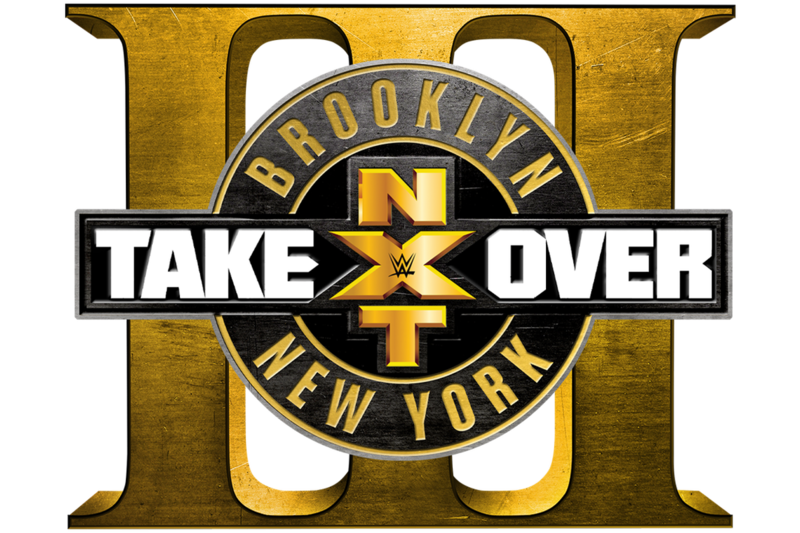 Ignoring the standard filming of matches for next week's NXT, every Brooklyn special so far has been six matches and currently, there are only five announced for this one, all of them straightforward one-on-one (or one team-on-one team) encounters, it's also become clear that Pete Dunne, Trent Seven, Tyler Bate and Mark Andrews are in the Americas at the moment. Could we be seeing a UK Title Fatal Four Way added to the card as a surprise? If that happens, will I be able to contain myself? Will I be able to contain myself anyway? Check back soon to find out. * I mean, we all know it's going to be Kairi Sane right?